This week I decided to enter some challenges that seemed too good to pass up. I love to look at the creativity out there and get inspired to make something new. On this card I used the sketch from Mojo Monday. (I totally missed the deadline last night) I combined it with the challenge # 103 over at Paper Cutz Challenge, titled "Schooldays-1,2,3". 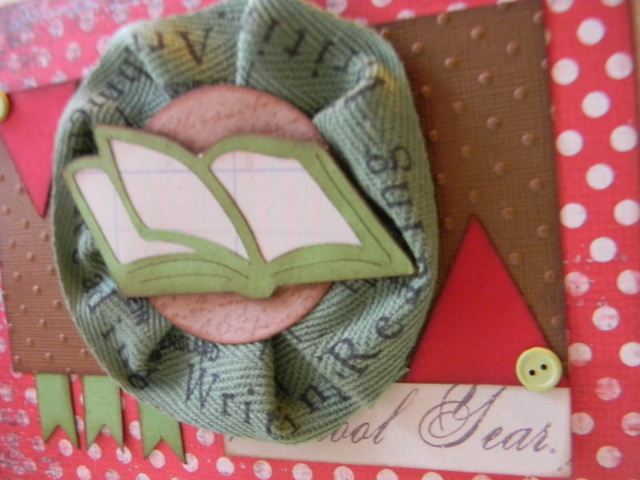 It required the use of 1 ribbon, 2 buttons, and 3 colors in a Back to school theme. It was hard to keep to the "rules" but nonetheless, I had fun making it. TFL! For the scallop edge, I incorporated a twill 1 ribbon that has school-theme sayings. On the pennants, I incorporated the 2 buttons, and my 3 colors were Red, Brown, and Green. 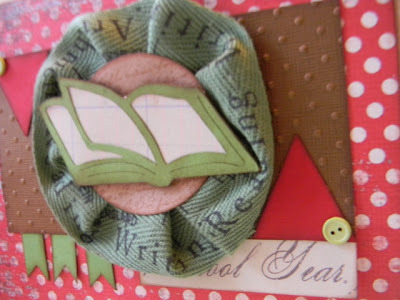 I used A Child's Year for the book, and Cuttlebug to emboss the brown paper. 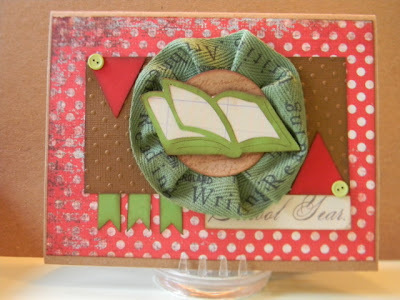 The polka-dot paper is My Minds Eye, all other paper and ribbon is Autumn Leaves, and all other cardstock was from my stash. This is so cute! Happy to be your newest follower.